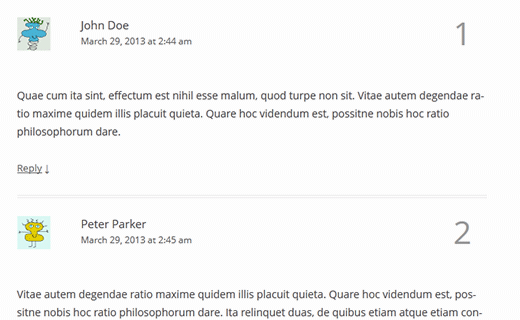 Earlier on WPBeginner, we showed you how to style your WordPress comments and the comment form. In this article, we will show you how to further customize the comment layout by adding numbers to your WordPress comments. First thing you need to do is install and activate Greg’s Threaded Comment numbering plugin. After activating the plugin, go to Settings » Threaded Comment Numbering. 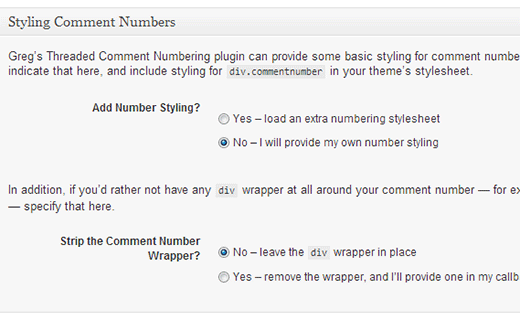 Under the Styling Comment Numbers section, select the option: No – I will provide my own number styling. Below that there is another option to Strip the Comment Number Wrapper. Select No on that option as well and save settings. For most folks this should work. However for some of you it may end up looking messy at first. You would need to take a few extra steps to fix that. Start out by finding which callback function your theme is using for the comments, and then add the plugin’s callback inside that function. twentytwelve_comment is the callback function you were looking for. Now you need to go to your theme’s functions.php file and look for the comment callback function. Once you find it, you will need to modify this function and add threaded comment numbering to it just before the author name. 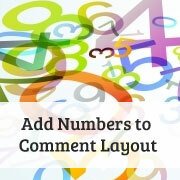 We hope this article helped you add numbers to your WordPress comments layout. Would you add numbers to your comments? Let us know by leaving a comment below. I’m thinking my theme (Custom Community) does not support callback. It’s not working for me. If you have any other suggestions, I’d love to hear them. Thanks so much. Your post is really informative. It is great to see a plugin that does the hard work for you. Thanks!